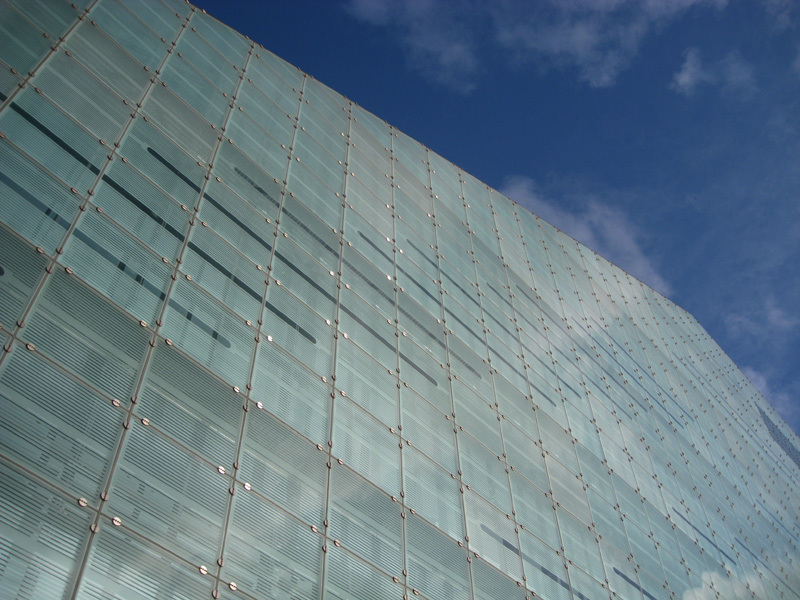 On Wednesday, I went to the URBIS in Manchester. It’s a great looking building. There were two reasons for my trip to the URBIS. Firstly was the D&AD exhibition of all of their annuals since its beginnings in the 1960s. It was interesting seeing how it had envolved over the last five decades but because the annuals were encased in glass and only one page displayed, the exhibition felt a little…stunted. Here was an opportunity to display 50 years of work, but it had been reduced down to just a few examples. The others from my class who had also come to see the exhibition felt the same way, asking “Is this it?”. It felt like a bit of a let down. However, more importantly than the exhibition and the main reason I had decided to come was because I had been selected for a portfolio surgery. A portfolio surgery, as I found out a few weeks ago, was a chance to spend 20 minutes with someone from the design industry and simply get a chance to talk about your work and invite comments on it. An opportunity that I didn’t want to miss out on. After signing up for one, I was happy when I recieved an email saying that I had been chosen to have my work looked at by a company called Thoughtful. I hadn’t heard of Thoughtful before so I spent some time doing some research into them, getting to know them via their website and their blog. I think it’s so important for someone like a design agency to have their own blog because it makes the company so much more accessible to the public and those people who may potentially hire them. Thoughtful’s posts were interesting to read and I left a number of comments to which I recieved a nice email from Stuart Price, one of the top guys at Thoughtful saying thank you for the comments. Putting my portfolio together prior to the surgery was a relatively easy task as I had already done it a few months ago for Univeristy. However, I had been wondering how to organise it so that it was in an order that would create the best impact. In total, I had 18 pieces in my portfolio, but since I only had a maximum of 20 minutes with the guys from Thoughtful, I knew that I had to trim that down. I managed to get it down to 15 instead, with more emphasis on my better projects, allowing me to spend more time talking about them and less time about some weaker projects. In addition to my work, I wanted to leave Thoughtful with a copy of my work. 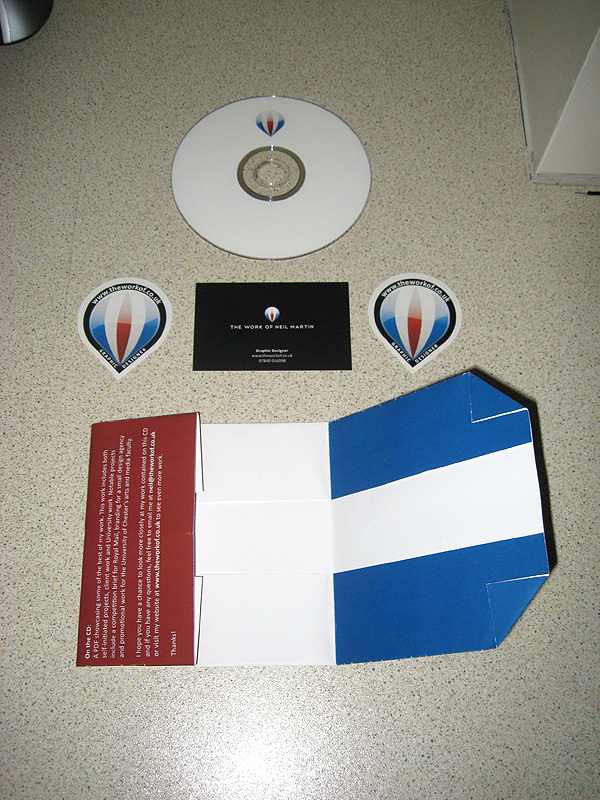 However, just handing over a CD seemed a bit of a missed opportunity and so I created some simple packaging for it, along with including my business card and some of my stickers. It wasn’t much, but it was enough to show that I already had my own brand. The interviews were being held in a large room, full of other design agencies. This included elmwood and The Chase. I could see into the room through the full length glass windows and managed to spot the Thoughtful team. It’s quite strange recognising someone you’ve never actually met before. I also noticed that Thoughtful had chosen to bring some students along with them who they were currently working with as placements. I think it’s such a great idea to give them a chance to see so many people’s work. Just before my interview, there was a talk from Ben Casey from The Chase about the D&AD exhibition. While it was very interesting to listen to him, as said before, there’s only so much you can say about such a small exhibition. Plus, I had to leave half way through because it was time for my interview. I have to admit that I was a little nervous about the interview. I suppose I was treating it like a job interview in some respects. I’d shown my portfolio to other people before so it wasn’t the first time I’d done this, but every time is always different. I sat down and Chris Jeffreys introduced himself to me, one of the guys from Thoughtful. He asked me if I minded if the three students sat in and looked through my work and I said I didn’t mind at all. It was quite interesting showing my work to four people instead of one. As I began talking about my first piece of work – my Oxfam posters – Chris interrupted me saying “I’m sure I’ve seen these before”. “You have”, I said, “On my website”. “Oh, you’re Neil!”, he said, referring to the fact that I had been commenting on their blog. It felt quite nice being known without having met Thoughtful and even nicer that they had taken the time to look through my work on my website. Chris critiqued my work for 20 mintues, saying what was good and what was bad. He noted that one of the things that I could possibly add to the portfolio was the actual artefacts that I had produced, such as my 10×10 book. I very much agree with that and next time I have an interview will definitely bring it with me. The 20 minutes flew over so quickly that it felt like I had only been sitting there for a few seconds. I think I was right to reduce the amount of work in my portfolio and ideally, perhaps should have reduced it even further because it did feel like I was rushing towards the end to make sure I got through it all. I think next time, ideally, I should have about 10 pieces of work instead of 15. At the end of the critique, I thanked the four of them for their time and Chris gave me a book called “It’s Not How Good You Are, It’s How Good You Want To Be“. I think it’s such a nice gesture to offer everyone a free book, especially one which had obviously been thoughtfully selected. In return, I gave them my CD with my work on it, shook the hands of all four of them and said goodbye. My only regret is not being able to spend more time talking to them. Thoughtful seem like, well, a thoughtful design agency to me. They come across as a company who are very easy to approach and I think that was reflected in my critique with them. I’ll be continuing to read their blog and see what else they get up to this year. Having the opportunity to discuss my work with them was a really useful experience and one which I hope I have many more of.